First up, thank you to everyone who let off steam along with me both online and off in regards to my rental rant last week. I’ve chosen to use my rental rage for good, and so this past weekend I channeled all said rage into bringing our rental kitchen into the 2000’s. It started so innocently on Saturday morning while Robert was asleep. “I’ll just reoganise the cutlery drawer … ” and as I gained momentum, much like Juggernaut, I was unstoppable. 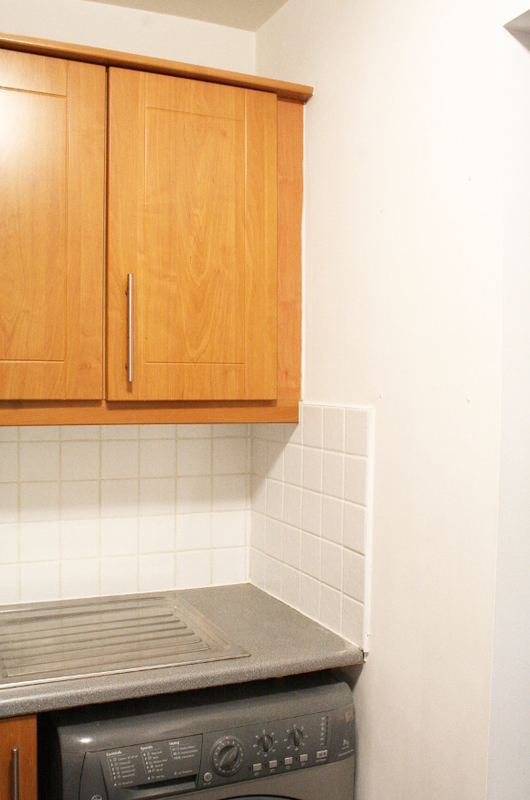 I whitened, sanded, scrubbed, stripped and painted our kitchen top to bottom in one day. I’ve got to say, even though I only painted everything white, it has made a world of difference. I started by taking everything off the walls and counter so I was starting with a blank canvas. I then tackled the more finicky task of bleaching the grout along the black splash. I normally clean it with an eco-friendly cleaner, but that never corrected the previous years of neglect [from the previous tenants]. I don’t use bleach unless I have to, so I figured this time wouldn’t hurt and I really had to go in with chemical warfare. I used thick bleach and a toothbrush and scrubbed all the grouting. I washed it off after 30 minutes, but I didn’t see the total effects until about an hour later. The grout came up beautifully. The kitchen hadn’t been painted during our time living here. I had white paint leftover from tackling the hallway a couple of months ago, so I got to work and repainted the walls next. That didn’t take long as there isn’t much bare walls. I recharged, then tackled the one thing I had been avoiding for months; the last door. 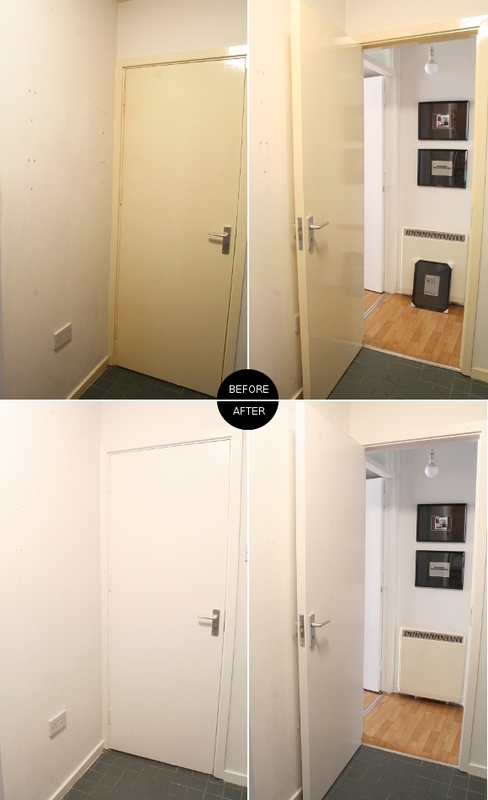 I sanded the kitchen door, frame and skirting boards and painted them WHITE. I had to take the shelves down in order to open the door and properly paint both sides of it. The shelves will be going back up as we need them for extra storage. It’s a teeny kitchen. I cannot tell you how much I love our kitchen now that it’s not accented with that hot mess of high gloss yellow door. But stay tuned because on Wednesday I’ll be sharing the fun bit [I think so at least] – the accessorising. I can’t wait to get in there and take a fresh look at our kitchen and reorganise it. Sometimes you just have to start from the beginning again. I picked up some extra goodies over the weekend that I cannot wait to add [and use!]. Woop! 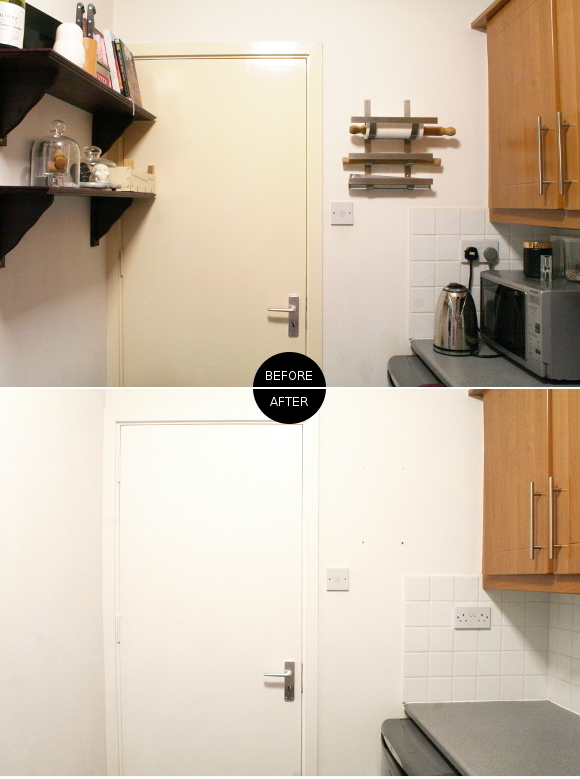 Next Post Kitchen update – reveal! I know, right?! I had to play it down in my head that the door being white wouldn't make a huge difference because I didn't want to get my hopes up. But I could tell from just one coat of paint what a difference it was going to make! And I suppose we must allow even bleach to have its moment in the spot light. It's only fair. I'm so glad to hear I'm not alone in enjoying seeing a cleaner space! It's just white paint, but heavens, it makes such a difference, doesn't it? 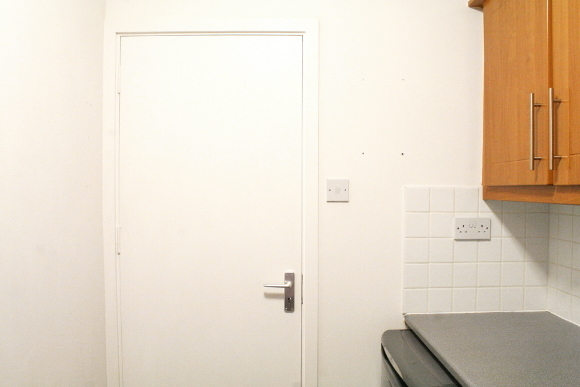 A lot of the same stuff will be added back to our kitchen, but at least I'm starting with a blank (WHITE!) canvas! Whoop – congratulations on finishing the final door! 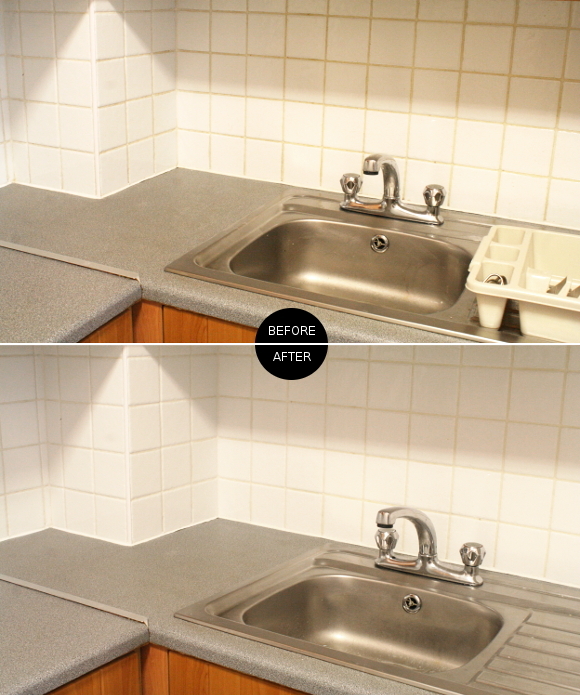 The kitchen looks so much lighter and brighter with the fresh paint and cleaned grout – what a difference! I tell you Maria, I didn't think I'd ever paint that last door! I hadn't painted a door in 3+ months and I was building it up to be worse and worse in my head. But I just got on with it and I can't believe I painted all NINE DOORS in our apartment. I deserve a DIY medal.